Beautifully lit by a collection of luminous sculptures, Venusian Gardens transforms into a wedding chapel unlike anything you have ever seen before. Located just outside the French Quarter, it provides an easily accessible location as a wedding hall for wedding ceremonies, receptions and private parties. Ceremonial options range from horse carriage rides to and from the Gardens, catering by any number of superb local chefs, to entertainment by a range of New Orleans musicians famous for jazz and other styles of music. Also, nearby is the Arts Bed and Breakfast, a wonderful B&B "with the comforts of home and the style of an art gallery," where family and guests can stay conveniently a short walk away and just a few blocks to the French Quarter. 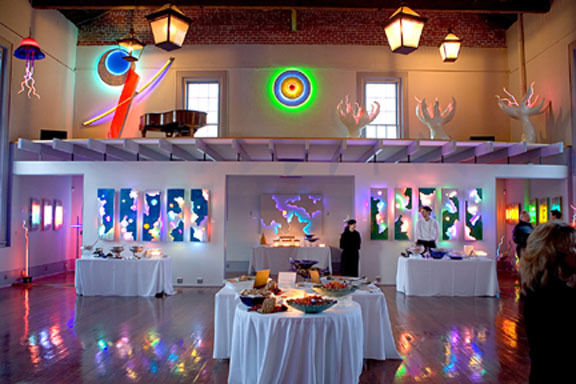 Last but not least, your ceremony can include a luminous neon sculpture designed specifically for you and incorporated into the wedding ritual! We can provide assistance in meeting all of your wedding planning needs from wedding invitations, wedding favors and gift ideas to wedding cake, flowers and champagne. We even offer a fabulous luminous wedding ring vow ritual unlike anything you have seen before! Beautiful wedding music by a variety of great New Orleans musicians and bands is available. Professional photographers can provide wonderful wedding pictures and video to help remember the occasion. Also included on this web site is an extensive list of French Quarter and New Orleans hotels, and restaurants for your lodging and dining needs.